Adobe Books presents the new exhibition series Adobe Books Parlor in the bookstore's front windows on 16th Street in the Mission District. The Pistils are the first group of artists to inhabit the window space with rotating window installations by different members each month. The exhibitions are free and open to the public with monthly scheduled opening events. The Pistils’ collaborative project will showcase an assemblage of artistic practices and invoke Adobe Books’ storefront as a locus of collective authorship. This dynamic group of artists will respond to the context of the bookstore and engage with Adobe Books’ ties to the local community. The installations will continuously change and transform during the course of six months and will range across sculpture, installation, performance, and social practice. Dating from 1364, the word parlor was used to mean a sitting room for private conversation. Contemporary understandings of the word parlor all imply visiting and contextualize dialogue in various forms. Considering these interpretations, the Adobe Books Parlor serves as the relative space between the street and the bookstore where artistic activity will redefine the visual systems through which ideas circulate. The Adobe Books Parlor is part of a long-term curatorial project that will commission artists to explore how the bookstore locates itself within the constant flux of the 16th Street environment. The series seeks to animate the intersections between private and public narratives, and among Adobe Books’ social and commercial spheres. The Pistils are Alexis Arnold, Christina Corfield, Nancy de Y Elkus, Rashin Fahandej, Laura Boles Faw, Cathy Fairbanks, Ruth Hodgins, Marya Krogstad, Mimi Moncier, and Lauren Ross. The Adobe Books Parlor is curated by Devon Bella. 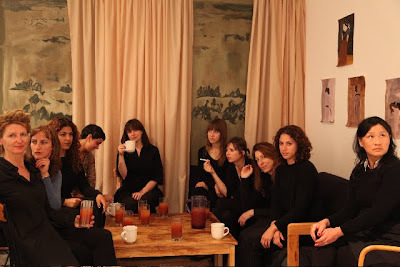 For the inaugural project, The Pistils have created a representative photograph of the working group in a tableau vivant based on the painting About a Girl (2005) by artist Mamma Andersson. This image was chosen for its characterization of a union of women that appear to have come together for a common interest. It emanates the spirit of closeness and focus that is intended with the collaborative efforts of The Pistils during this project. (See picture above). InterMissions are a series of short, intermittent events within and around the window areas that will challenge our notions of display, exhibition and social activity, the first of which is Unbound. Thematically, each will refer to the production of space as an ongoing and ever-changing activity within which we are all participating. The Parlor project is a salon style exhibition where the storefronts will invite the public to sit, read, and converse. The first use of the spelling parlor (c.1225), deriving from the Old French word parler (to speak), referenced windows through which confessions were made. This salon will rejuvenate the history of specialized rooms for reception, as well as beguile the visitor with the bookstore’s complex terrain of social engagement and independent activity. For this project, the artists are interested in the notions of metamorphosis and the visualizations created when captivated by an astounding piece of literature. The 1925 Russian novel, Heart of a Dog, by Mikhail Bulgakov, will be used to visually play out personal interpretations of a tale where transformation and alteration are intertwined as part of the narrative. For this remarkable commercial and community interface, a sculptural tableau will be created featuring books, texts, poetry, and input from the local community. Historically a parlor is a location for gaming, entertainment, and the reception of guests. The Gaming Commission will employ the Adobe Books Parlor storefronts to just such an end through the installation of a salon putting green and a pedal-powered tandem-bicycle reading station.